Backplane Systems Technology has unveiled DIGITAL-LOGIC’s MICROSPACE-PC, the MPCV855, a micro industrial PC based on an EPIC format embedded board. The MPCV855 computer has no cooling fan; instead it relies solely on passive cooling techniques. This makes the MPCV855 an ideal solution for reliable, cost-effective long-term operation in industrial and commercial applications. 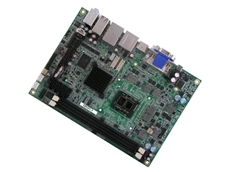 The MPCV855 is based on the i855GME chipset and uses an 800MHz Intel processor. The device is equipped with 256MB of DDR RAM, expandable to 512MB or 1GB. 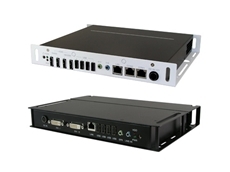 The PC features four USB2.0 ports, eight digital I/Os, two RS232C interfaces, dual LAN with a 100/10Base-T-Ethernet and a 1GB Ethernet port. Two PC/104-Plus sockets and a MiniPCI socket can be used to add additional features. The extreme graphic video controller is integrated into the i855GME chipset and offers a video memory of up to 64MB. The controller has two separate video outputs (standard VGA and 18-bit LVDS), which may be connected simultaneously to display the same image twice or two images separately. A 2.5" hard disk with a storage capacity of up to 100GB is available. Besides the basic MPCV855 model, the computer is also available in an industrial or multimedia version. 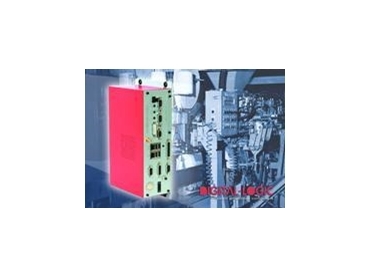 The industrial variant, the MPCV855I, additionally provides two opto-isolated RS422/RS485 ports and a printer interface. 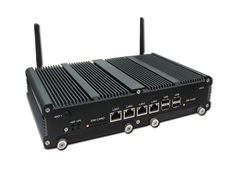 The MPCV855M multimedia model offers a 24-bit DVI interface, TV output and an AC97-compatible audio controller with 5.1 sound and SPDif output. The MPCV855 weighs just 3kg and has dimensions of 290mm x 145mm x 79mm (W x L x H). The computer is supplied by a voltage of 9VDC to 30VDC, therefore can be used in switch cabinets as well as in battery-powered systems.